World Wrestling Entertainment (WWE) Braun Strowman has returned to training and will be fit to compete against Brock Lesnar for the Universal title at the Royal Rumble pay-per-view event. World Wrestling Entertainment (WWE) Braun Strowman has returned to training and will be fit to compete against Brock Lesnar for the Universal title at the Royal Rumble pay-per-view event. The star wrestler took to social media to confirm that he is back in training after staying out for eight weeks.
. “And so it begins!!!! 8 weeks without training has been killing me. The first day back training shoulders. 25lbs at a time. 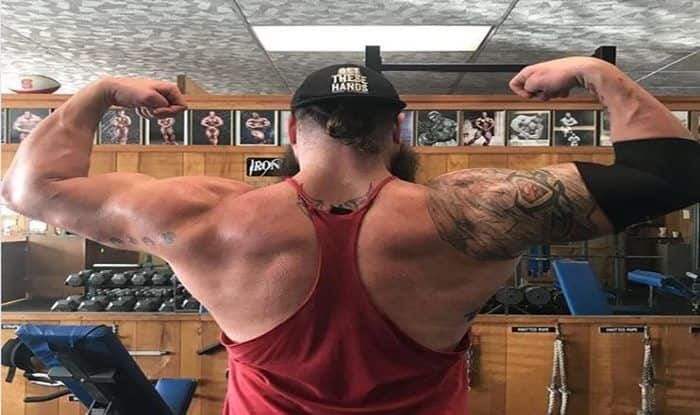 Slow and steady and getting ready to pass these out #MeatCastle#TheMonsterAmongMen #BraunStrowman#WWE #GetTheseHands #DaddyGotBack#FlexinOnBiatchsAsHardAsICan#IronPhysique #HomeGym#WereMonstersAreMade,” Strowman wrote on Instagram. Earlier in the TLC, Braun Strowman defeated Baron Corbin in a special stipulation match which he used to his benefit with a twist to the one-on-one match. Strowman said that since it’s a no disqualification match he can be accompanied by anyone he likes and was thus joined by Bobby Roode, Chad Gable, Finn Balor, Apollo Crews and with the special guest referee Heath Slater. To make matters worse for Corbin, Kurt Angle returned and hit the ankle slam on him. This led to the latter losing out on his authority as the acting-manager of WWE’s weekly show RAW. Following the victory, Strowman took to social media to warn Universal Champion Brock Lesnar about their upcoming fight at the Royal Rumble event. “…and to think I beat you without lifting an arm. Next stop is #RoyalRumble … @BrockLesnar is gonna get these hands!!! #WWETLC #MonsterAmongSlings,” Braun wrote on his Twitter handle. Brock Lesnar will take to the ring against ‘the Beast’Brock Lesnar in a WWE Universal Championship match at the Royal Rumble 2019 event on January 27th.